"This story depicts the mysterious Stone Mask from Mexico, and its effect on the destinies of two youngsters and their Bizarre Adventures!" — The prologue of chapter 1. Of 930 and counting. JoJo's Bizarre Adventure (Jojo no Kimyou na Bouken) is a long-running Manga series created by Hirohiko Araki. The series tells the story of the Joestar family and their endless conflicts with the supernatural. The series spans well over fictional 100 years (and volumes), having been continuously published for the past 30 years. Each part of the saga chronicles the adventures of a member of the Joestar bloodline, which spreads all over the world and gets pretty darn confusing. They all have three things in common: a star shaped birthmark, a destiny to fight evil, and the nickname JoJo. Also central to the series are the power of Hamon, a martial art that channels the user's inner energy into a form similar to sunlight, and Stands, psycho-spiritual manifestations of willpower that can have a wide variety of abilities. Each JoJo must gather a group of allies, master Hamon or their Stand, and defeat whatever villain is threatening the world. The story is split into eight parts, the first six of which form their own saga focusing on the impact of a mysterious Stone Mask as well as a series of equally mysterious Arrows on the Joestar family's lives. The series undergoes a Continuity Reboot of sorts with the storylines that occur afterward, set in an Alternate Universe that features many of the elements from the first six storylines. The series is famous for its original and unique art style, intricate plot, creative battles, and immense flamboyancy. It also features a huge number of allusions to Western rock music, including characters named Speedwagon, and Zeppeli, just to name a few. In spite of its immense popularity, the series did not have a full anime adaptation for a long time. A series of OVAs based on Part 3 and a now lost-to-history feature film adaptation of Part 1 were released in the meantime, though both took liberties with the source material. To commemorate the manga's 25th anniversary in 2012, the long-awaited anime adaptation produced by David Production, written by Yasuko Kobayashi that adapts Part 1 and Part 2, finally debuted. The 2012 anime was followed up with an adaptation of Part 3 in 2014, with an adaptation of Part 4 on April 1, 2016, and also Part 5 in 2018. At Anime Expo 2015, it was confirmed that the 2012 anime would be getting an English dub. A similar announcement was made in 2016, with the test dub's cast returning. It finally saw its long-awaited debut on American airwaves via Toonami on [adult swim], premiering October 15, 2016. The subbed anime can legally be viewed on Crunchyroll. The Western audience's history with JoJo's Bizarre Adventure is an interesting one. For a long time, the manga only had a small following, and the west at large was more familiar with the Capcom fighting game Heritage for the Future and OVA adaptations of Stardust Crusaders, mainly due to all the memes both produced. With the advent of the David Productions anime, the JoJo franchise's popularity skyrocketed worldwide, bringing in legions of new fans and spawning even more memes. The manga's 30th anniversary in 2017 saw the release of a live action film based on Part 4, directed by Takashi Miike. Principle photography began in late 2016 in Sitges, Spain, which doubled for the fictional town of Morioh. Stardust Crusaders (Ran from Apr. 3, 1989 to Apr. 27, 1992; originally titled Jotaro Kujo: Heritage for the Future)note Manga volumes 12-28; OVA episodes 1-13; TV anime Season 2. Diamond is Unbreakable (Ran from May 4, 1992 to Dec. 4, 1995; occasionally referred to as Diamond is not Crash/Crush and originally titled Josuke Higashikata)note Manga volumes 29-47; TV anime Season 3. Stone Ocean (Ran from Jan. 1, 2000 to Apr. 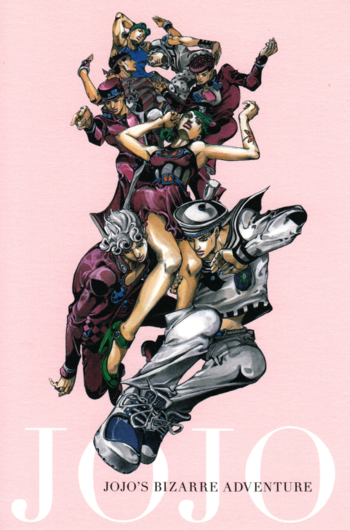 21, 2003; originally titled Jolyne Cujoh: Stone Ocean)note 17 manga volumes; beginning with this part, each part is treated as a separate book from the last and restarts the volume numbering at 1. There is also the series of spinoffs of one-shots chronicling the adventures of the eccentric Author Avatar manga-artist Rohan Kishibe, Thus Spoke Kishibe Rohan, which sometimes gets serialized either in Weekly Shonen Jump, Jump SQ, Shōnen Jump+ or Bessatsu Margaret. The chapters/one-shots (the first one published back in 1997) were compiled in two trade paperbacks. Also important to remark is that Kishibe has also starred in similar special one-shots such as Rohan at The Louvre (in collaboration with the Musée du Louvre) and Kishibe Rohan Goes to Gucci as a special collaboration between Araki, Gucci and Spur Magazine in 2011. An OVA of this spinoff series was made available to anyone who purchases the entire Blu-Ray set of the Diamond is Unbreakable anime, a second one was released in a bundle with pre-orders of the limited edition of the second manga volume. Several Light Novels set in the universe of the series have been written over the years, usually to celebrate a milestone of the series. The Genesis of Universe (November 4, 1993; written by Mayori Sekijima and Hiroshi Yamaguchi): Two short stories featuring original stand users who encounter Jotaro's group during the events of Stardust Crusaders. Golden Heart, Golden Ring (May 28, 2001; written by Miya Shotaro, Gichi Otsuka with Araki's involvment): A story narrating Pannacotta Fugo's adventures in Venice after he is left behind by Buccellati's team, during which he saves a girl and manages to help his former teammates without betraying Passione. JoJo's Bizarre Adventure 4th Another Day (November 2007; written by Otsuichi and illustrated by Araki): Six months after the events of Diamond is Unbreakable, Josuke and co. discover another evil Stand user in town: Takuma Hasumi, a teenager with a tragic past looking for revenge. Purple Haze Feedback (September 16th, 2011; written by Kouhei Kadono): Six months after Vento Aureo ends, Pannacotta Fugo returns to the Passione gang, where he is given a new assignment to earn his trust. Jorge Joestar (September 19th, 2012; written by Ōtarō Maijō): This novel covers two arcs: one concerning the life and times of George Joestar II, nicknamed Jorge during his adolescence on the Spanish island of La Palma; the other telling an especially bizarre story about a young detective named Joji Joestar trying to stop an Eternal Recurrence of Cosmic Retcons (a plotline which liberally borrows and toys with elements from every other part). JoJo's Bizarre Adventure: An RPG by WinkySoft, covering the events of Part 3. Heritage for the Future: A fighting game by Capcom, covering the events of Part 3. GioGio's Bizarre Adventure: Golden Wind: A PlayStation 2 game based on Part 5. Jump Superstars: A Shonen Jump Crossover Platform Fighter. Jotaro and DIO appear as playable characters, while Gyro shows up as an Assist Character. Jump Ultimate Stars: A sequel to Jump Superstars. Jotaro, DIO, and Gyro return in their respective roles, while Jonathan, Joseph, Josuke, Giorno, and Jolyne appear as Assist Characters. Phantom Blood: Another PlayStation 2 game, this time based on Part 1. All Star Battle: A PlayStation 3 fighting game by CyberConnect2 featuring characters from all over the series' timeline. J Stars Victory VS: A Shonen Jump arena fighter. Jonathan and Joseph (in his Battle Tendency incarnation) appear as playable characters. Eyes of Heaven: Sequel to All Star Battle, adding 2v2 battles and an original Bat Family Crossover storyline. Jump Force: Another Shonen Jump crossover arena fighter. Jotaro and DIO are playable characters. There is a Character Sheet for each of the parts, so post character tropes there.